ARLINGTON, Va.–A $10 accessory that prevents debris from damaging a $2 million piece of equipment. Updating old-school communications like Morse code with lasers and infrared light. Creating a hydrogen-gasoline fuel hybrid to lessen the thirst for fossil fuels. These were some of the ideas pitched by five Sailors during Athena DC 1.0, a challenge held at this week's Sea-Air-Space Exposition at the Gaylord Convention Center in National Harbor, Maryland. The event was styled in the fashion of the "Shark Tank" TV show, where entrepreneurs compete to have their business ideas funded by titans of industry. The event (the first held in the Washington, D.C., area) was hosted by the Athena Project–an initiative that organizes public forums where Sailors can submit ideas for improving their individual commands (or the Navy in general) to a panel of experts and an audience of representatives from academia, industry, the military and government agencies. The challenge's panel of judges included Dr. Lawrence Schuette, director of research at the Office of Naval Research (ONR); Vice Adm. Philip Cullom, deputy chief of naval operations for fleet readiness and logistics; Dr. Ralph Semmel, director of Johns Hopkins Applied Physics Laboratory; and Sharon Beermann-Curtin, deputy director of the Strategic Capabilities Office. "Forums like this are extremely valuable," said Schuette, "because they bring visibility to the challenges and concerns that Sailors face daily. They allow the Navy to harvest ideas directly from warfighters, who are encouraged to approach and solve problems in unique ways." Each of the five Sailors had five minutes to pitch an idea, followed by questions from the judges and audience. Participants were graded on idea quality, feasibility and presentation. The winner was Aviation Electronics Technician 1st Class Michael Pecota of Fleet Readiness Center Mid-Atlantic, Detachment Patuxent River, Maryland. He suggested using 3D printing to create caps to cover sensitive sensors on sonar transducers used to locate submarines. This would prevent foreign objects and other debris from collecting in the transducers between uses or during transport–extending equipment life and reducing clean-up time. Pecota received the Admiral Sims Award for Intellectual Courage, financial support from his command, and access to Athena's network of past winners and acquisitions and research contacts. Senior officials in attendance from the Naval Air Systems Command also pledged to help Pecota transition his idea from concept to fleet usage. — Lt. James Landreth, Naval Nuclear Power Training Unit in Charleston, South Carolina: Landreth discussed using Oracle software to predict Sailors' performances on computerized exams and design individualized training programs. — Lt. Takeru Tajiri, Littoral Combat Ship Crew 104: If electromagnetic spectrums used within a ship's communications network are jammed, Tajiri proposed a backup computer program that could read light spectrums, translate them into text, and send Morse code-style messages using laser or infrared light via airborne drones or balloons. — Lt. Daniel Walker, Naval Supply Systems Command: To improve training to prevent at-sea collisions, Walker suggested creating augmented reality (where virtual objects are imposed onto real-world vision) that mirrors a ship's bridge and potential obstacles. — Hospital Corpsman 2nd Class Joshua Cranford, Annapolis Naval Hospital: Walker proposed a hydrogen-gasoline fuel hybrid that could potentially power engines while reducing Navy consumption of fossil fuels. 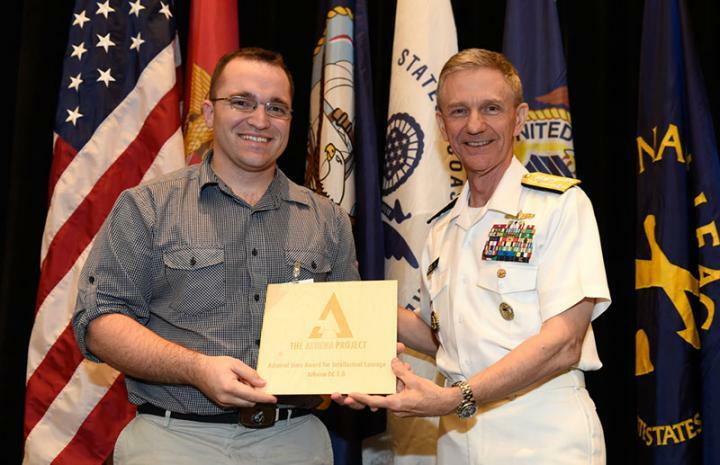 "Athena and initiatives like it are absolutely critical to the Navy's future," said Lt. Cmdr. Dave Nobles, an ONR reservist and the founder of Athena. "Not only because of the strength of the ideas, but also in developing creative leaders with the intellectual courage to share those ideas."